The power of incumbency, a City Hall machine, and the bully pulpit are all advantages for an incumbent like Byron W. Brown as he seeks a fourth mayoral term this year. But Mark J.F. Schroeder is equally adept at summoning all his powers as Buffalo comptroller. He and his staff are churning out news releases and audits critical of Brown – all part of his duties as Buffalo’s fiscal watchdog. And because comptrollers are elected to criticize, suggest and monitor the city’s executive and legislative branches, Schroeder finds himself in the enviable position of being sanctioned to lay it on. 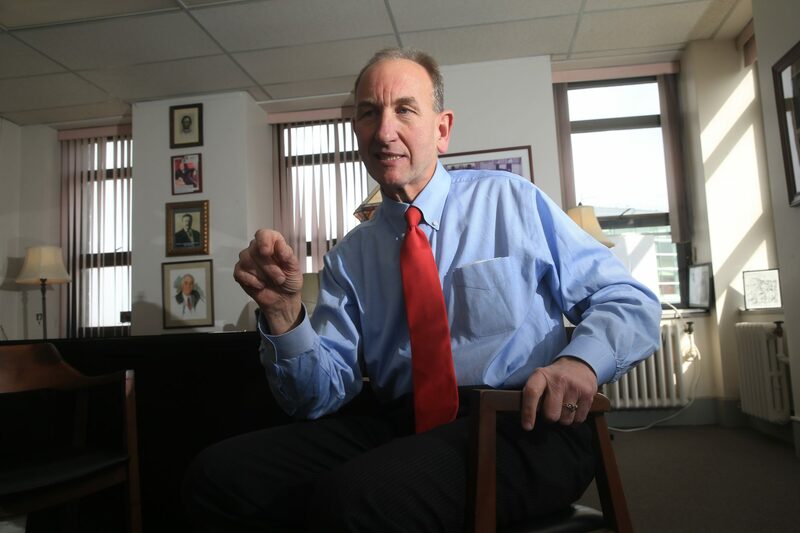 “Fifty days before the Democratic primary, a 12-year mayor is restructuring the BMHA,” Schroeder said as part of continuing criticism of Brown’s role in the Buffalo Municipal Housing Authority. • Criticized the Buffalo Fire Department for allowing a dozen civilian dispatchers to work 24-hour shifts on 137 occasions in the past fiscal year, in addition to seven instances of employees working 48-hour shifts. “The most troubling thing about this situation is that these are dispatchers who people rely on to address emergency situations,” Schroeder said. “If I am a citizen making an emergency call, I don’t want my dispatcher to be on the tail end of a 48-hour shift. • Lambasted the Common Council’s Finance Committee for shifting discussion of the Fire Department audit to a meeting room on July 12, instead of in Council chambers and available online and on cable. • Acknowledged on July 14 that civilian dispatchers in the Fire Department can sleep on the job for 10 hours during their 48-hour shifts, but didn’t let up in his criticism. “If there were enough dispatchers, the city wouldn’t have to pay any of them to sleep,” Schroeder said, noting Fire Department overtime totaled $10 million last year. • Tore into the Brown-controlled BMHA for taking 16 months to acknowledge Schroeder’s contention it owed the City of Buffalo $4 million, pointing to a July 5 Law Department statement that BMHA no longer disputes the debt. “It is troubling for taxpayers that it took 16 months to reach this obvious conclusion after these debts were brought to the Common Council’s attention through multiple communications from my department in March 2016,” he said. For sure, Brown has used his own bully pulpit dozens of times over the years to call attention to his projects and highlight the accomplishments of his administration. His office this month has issued six press releases so far touting everything from the opening of city swimming pools to recruitment for the Northland Corridor pre-apprentice training program. And he is practically guaranteed to appear daily in the newspaper and on television just by virtue of his job. Schroeder says none of his efforts should be viewed as political. He said he has issued 39 press releases and more than 60 audits over the past five years and Brown has never cried politics. He pointed to the constant battle between County Executive Mark C. Poloncarz and County Comptroller Stefan I. Mychajliw Jr. and said no such conflict rules City Hall. Brown appears to agree, even if hinting that politics may occasionally enter the situation. "The comptroller's office has a charter mandated role in city government and I respect the role regardless of motivation," he said. Schroeder also said voters can expect he will continue issuing his audits and press releases and that they will probably prove fodder for the campaign.